Triode Wire Labs “American” Speaker Cables follows the extended and in-depth technical elaborations with the organic, natural sonic ability, that had no problem in bringing the impressive dynamic aural experience. One of the most important aspects of “American” cables sonic standouts is the highly engaging factor, not expected at this price range. Peter Grzybowski has again managed to deliver a mighty potency of the original audio material without sonic alterations. It’s not easy to encapsulate the very verisimilitude of the music being recorded with such impact. Even with the delicate reproduction of the string plucks, where the basic frequency demands the conductor of highest purity, the Triode Wire Labs speakers cables have embraced the constitutional aural particles with surprising density, that had not only conveyed the golden trinity of timbre, tone and colour spot on, but also delivered extremely well the harmonics. This elevates them to the very unique plane, that is usually reserved for quite a different price sticker! At the times, when the prices of high-end audio speakers cables are becoming a matter of exuberant and luxurious pricing the Triode Wire Labs “American” Speaker Cables embraces the grander portion of the upper echelon cabling qualities at very reasonable and down to earth pricing. I’m joining the sum up of my thoughts connected with my initial review of Triode Wire Labs power cables. “American” Speaker cables are fantastic performers and they offer a grand entrance into the world of high-end audio without any setbacks. Triode Wire Labs “American” Speaker Cables not only represents a great value and a highly potent loudspeaker cable, but they distribute the music’s energy and vital information with such ease, that they will have no problem serving even in upper echelon high-performance high-end audio system. The carefully selected materials combined with a quality build produce PERFECT NATURAL PRAT (Pace, Rhythm & Timing) and will be true to the original source, without coloration. 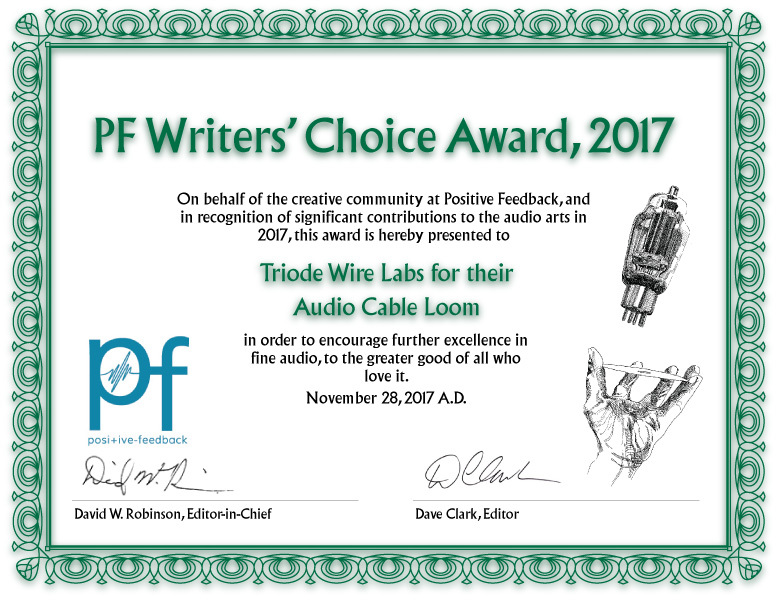 If you’re in the market for an “expensive” ULTRA-FI speaker cable, do not skip the auditioning Triode Wire Labs “American Speaker Cable” to hear what’s possible at Affordable, Audiophile prices! For what they represent, and at what value I’m wholeheartedly awarding them with the Mono and Stereo Highly Recommended Award. This review resulted in me obtaining their PF Writers’ Choice Award for the Year 2017!